Despite it remoteness, St Kilda, is globally connected. The collection of eggs and hunting of birds provided a significant amount of sustenance to those living on Hirta. Stone shelters, Cleits, were built and used to air dry the birds for consumption later. Climbing cliffs and seasonal stays in bothies on the archipelagos other islands and stacks to hunt was part of the strategy for sustaining life. Stac an Àrmainn is the highest sea stack (196 m) in the UK and is the location of at least two powerful tales. One tells of the group of three men and eight boys from Hirta who were stranded here in 1728 for 9 months. Upon returning they were to find that during their absence most of the community had died, all bar 4 adults and 26 children, from small pox. The second tale, from about 1840, is of the death of what was probably the last Garefowl (Great Auk) in Scotland, when three men allegedly thought it to be a witch, only a few years before the species became extinct. Harvie-Brown, J A 1888 Vertebrate Fauna of the Outer Hebrides p 158-59. Henderson, L. (2008) Witch-hunting and witch belief in the Gàidhealtachd. In: Goodare, J. and Martin, L. and Miller, J. (eds.) 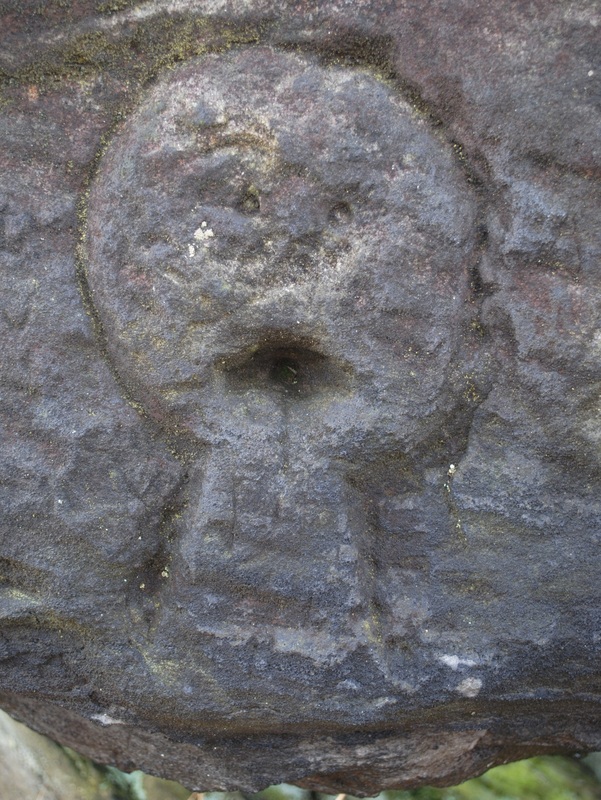 Witchcraft and Belief in Early Modern Scotland. Palgrave historical studies in witchcraft and magic. Palgrave Macmillan, pp. 95-118. Campbell, J G 1902 Witchcraft and Second Sight in the Highlands & Islands of Scotland : Tales and Traditions collected entirely from Oral Sources. Glasgow. Seeing a Great Auk in Scotland in the first half of the 19th century would probably have been a rare occurrence, numbers already depleted, and with the last small colonies on Iceland some distance – so there may have been no familiarity with this species of bird among the men on Stac an Àrmainn. Whether the killing of the last Great Auk in Scotland as a witch (presumably in a shape shifted form) is true or not, today we are faced with the certainty if we do not do things differently other species will become extinct and St Kilda and the wider world it represents will be poorer for such losses. How will we explain to future generations, what will undoubtedly seem 170 years in the future as, unjustifiable behaviours which lead to such losses. Seemingly enlightened, we may not fear witches, but through our behaviours we make our offerings to other gods of consumption and waste. They may not be so overt but our brutalities can be small, long and incremental. I was privileged to journey to St Kilda earlier this year with the wonderful Kilda Cruises a great highly knowledgeable team. Imaginary Island – journey through the south west. Borne of Stone, between Sky and Water, was what occurred at the site. 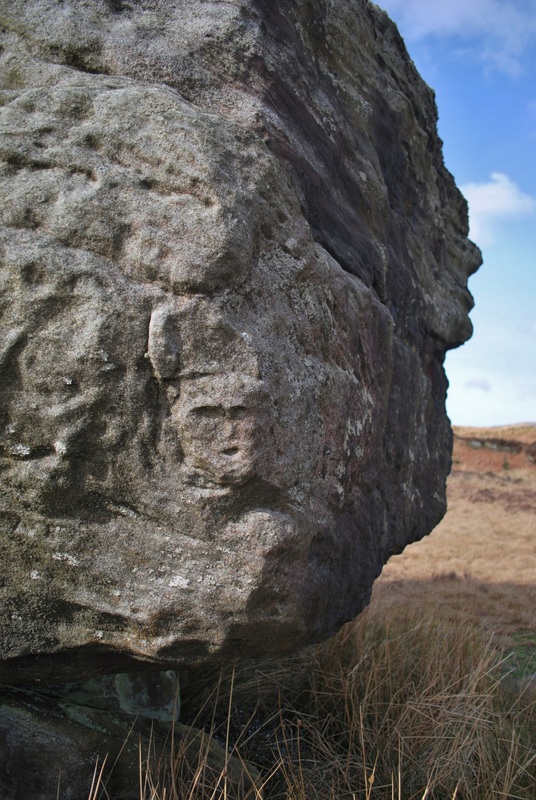 with accounts of mysterious carved heads on a large stone block on Craigmaddie Muir. Approaching the site revealed two things. 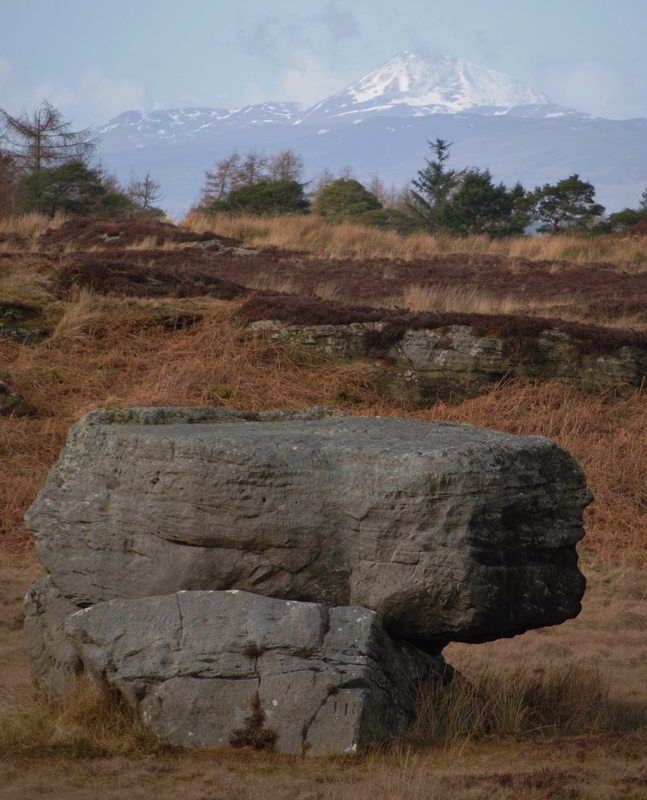 is only a few meters away from higher ground to the north which affords views to Ben Lomond and the Highlands beyond. 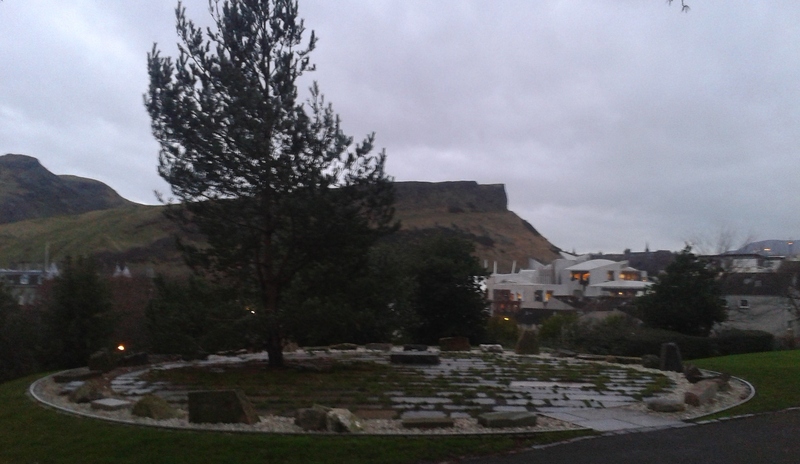 Yet, these views to the north are obscured, when you are at the site, by the basin of rock it sits within. Scales of landscape nested at this location giving further potency to the boulders distinctive form. Moving closer, a proliferation of graffiti becomes apparent. 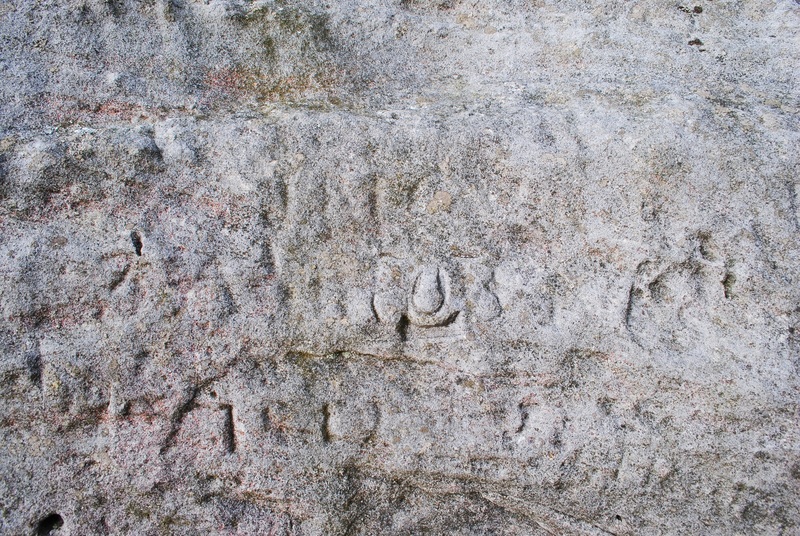 Little triumphs from mortality, names and dates, still clinging from the vagaries of geological time. As you move around, it reveals the dolmen like arrangement of stones which form an irregular channel running broadly south west to north east. Each is distinct, with particular morphological characteristics, and each, with wear, chip and lichen veils upon the rock surface, has signs of antiquity. 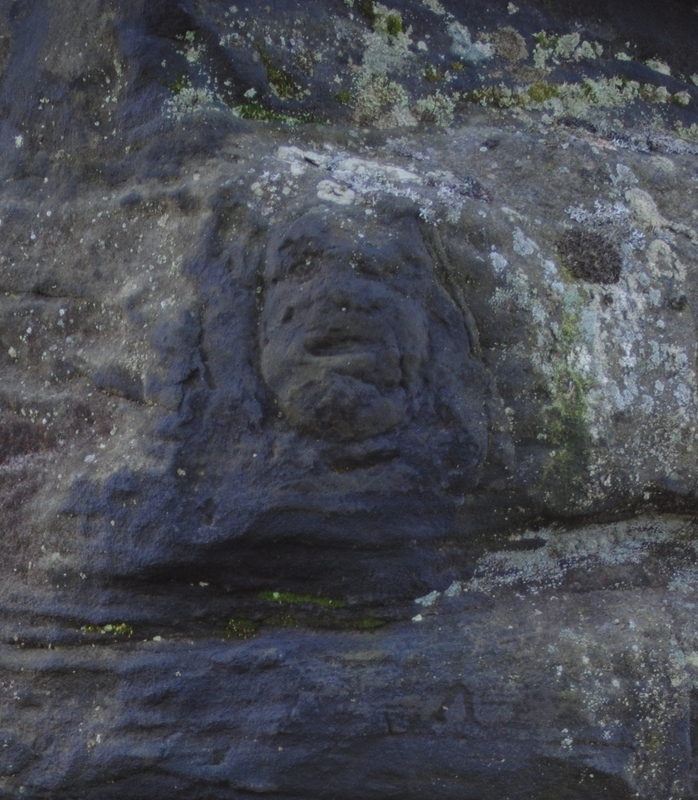 As has been noticed before, all the heads (apart from one on the upper face of the upper stone Head I) are executed on the easterly portions of the rocks. The western ends of the stones are unembellished, headless. 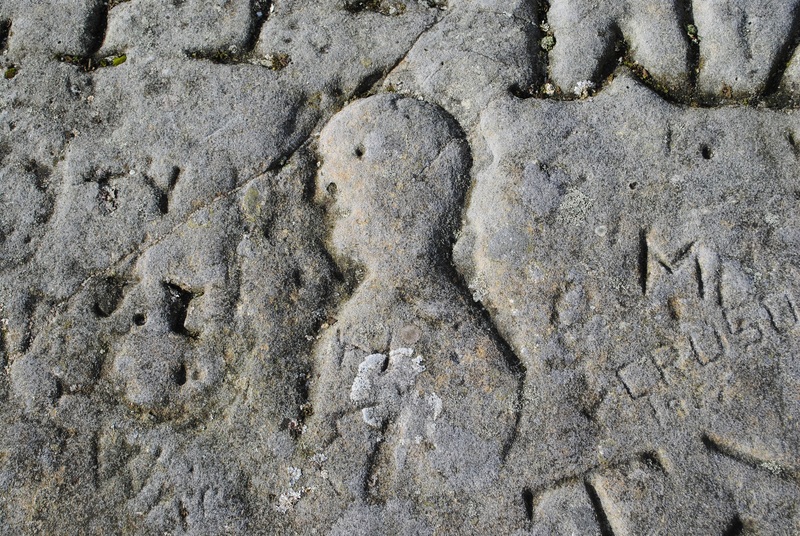 This pattern suggests there was a deeper understanding about where on the rocks it was appropriate to carve these heads and as such they may have been composed or understood collectively in some way. Together they give a sense of a pantheon of individuals, each perhaps with a unique name or association in the past. For example, it was suggested by Alcock (1977) that Head A has a horn extending from its right side, and another may have existed on its left but is missing due to breakage. As such, he suggests that Head A could represent Cernunnos. 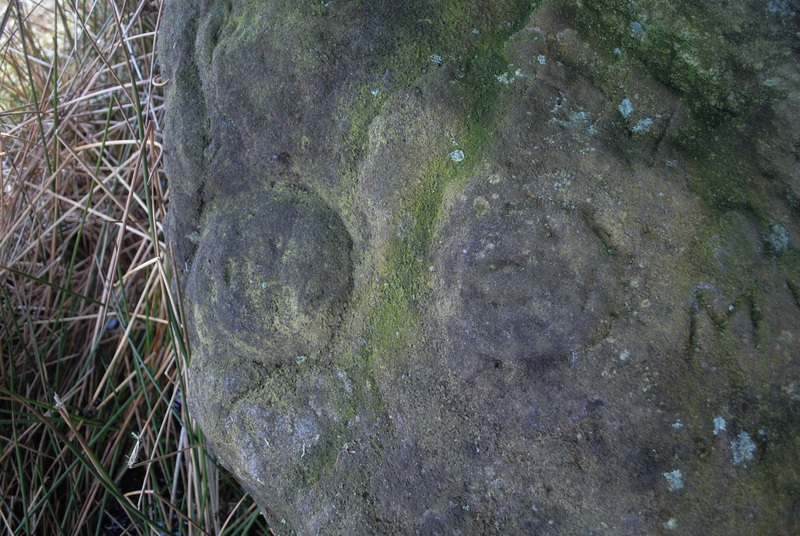 Closer scrutiny reveals three other possible carved heads. 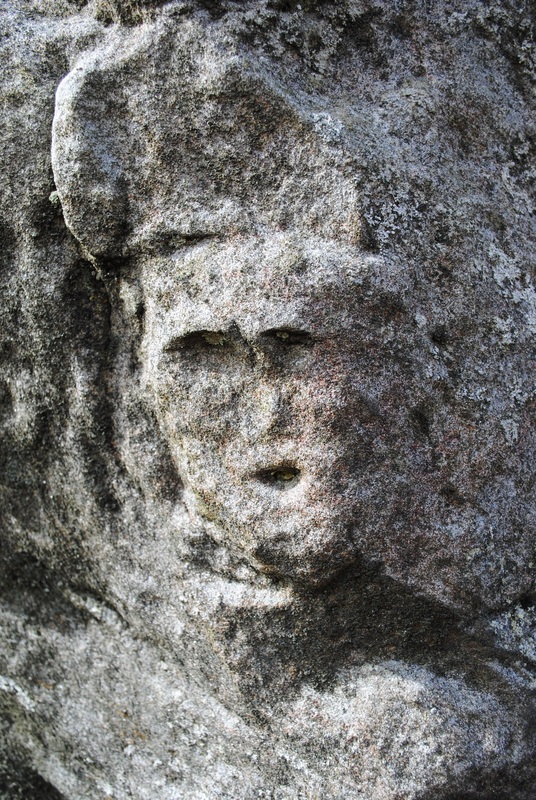 One (Head K) is located on the upper eastern part of the south facing stone. 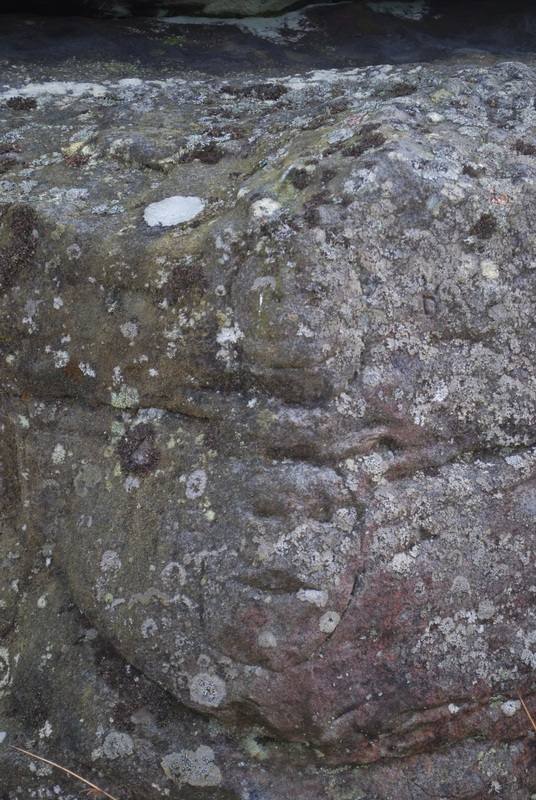 It watches over you as you climb up to the top stone to visit head I. Using a series of distinct stone cut steps (which are well worn suggesting some age) you ascend. When you reach the top the highland views to the North are again revealed. Watching this ascent, to the land of northern skies, is another visage (Head K), nestling amongst other incised lines. 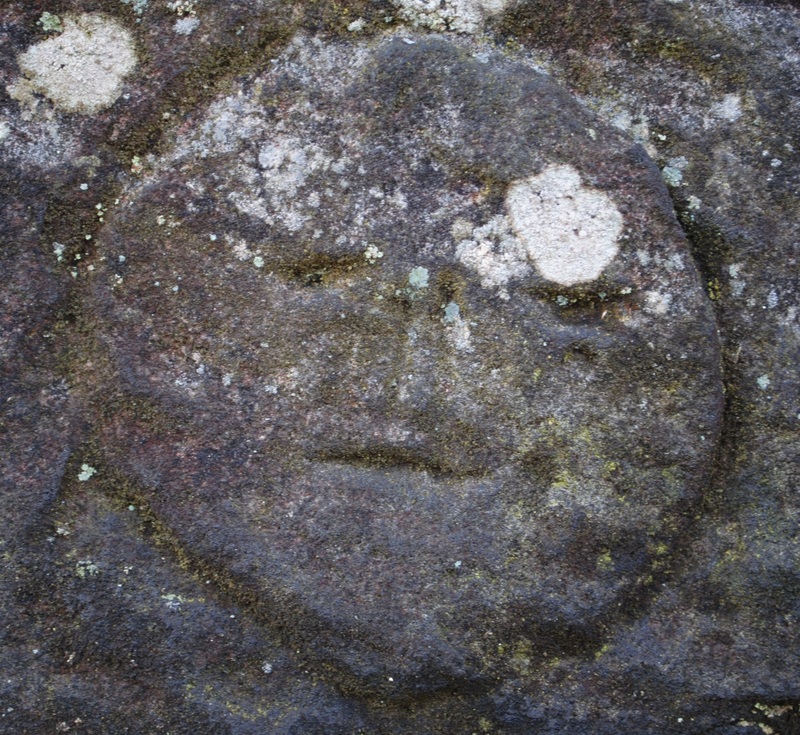 It has a distinctive mouth, cheeks appear to bulge, eyes half shut, almost smiling or grimacing at those who ascend. 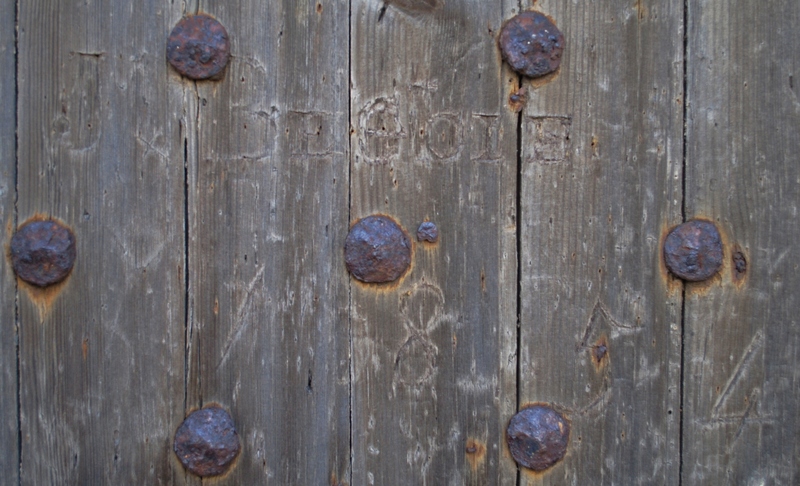 Other lines above could be representations of horns or hair : but perhaps could be other earlier forms of lettering. Another head (J) is closer towards the ground and retains a focus on the eastern end of the rocks. Head J is located as you enter the space between the rocks, lower towards the ground at the corner between two rock faces. 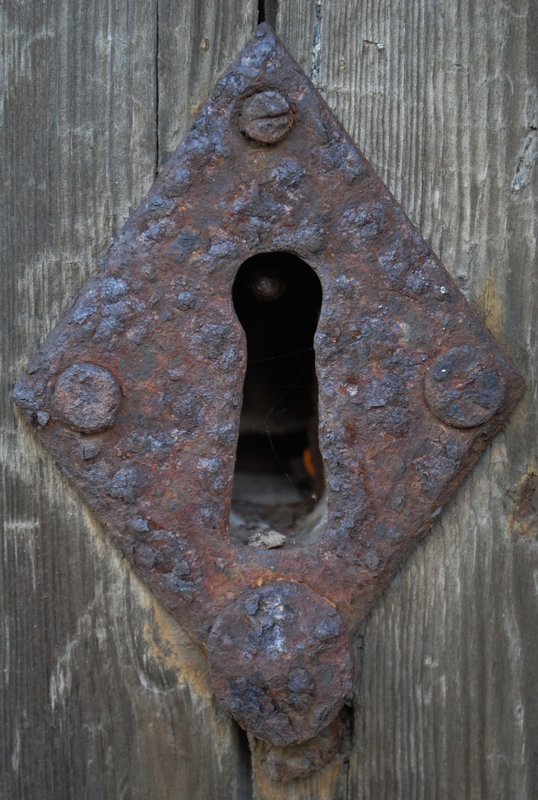 It is worn, but has a pronounced nose, possible mouth, eyes and brow ridges distinguishable. 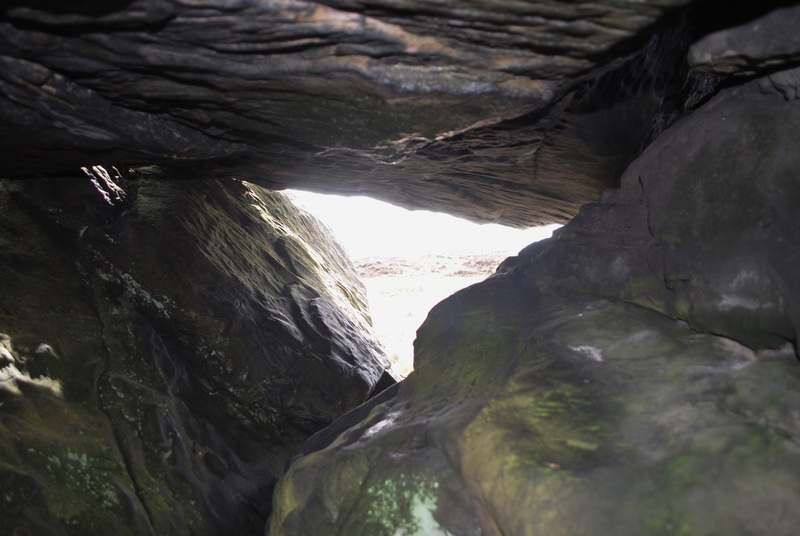 The third possible head (Head L) is within the rock passage. 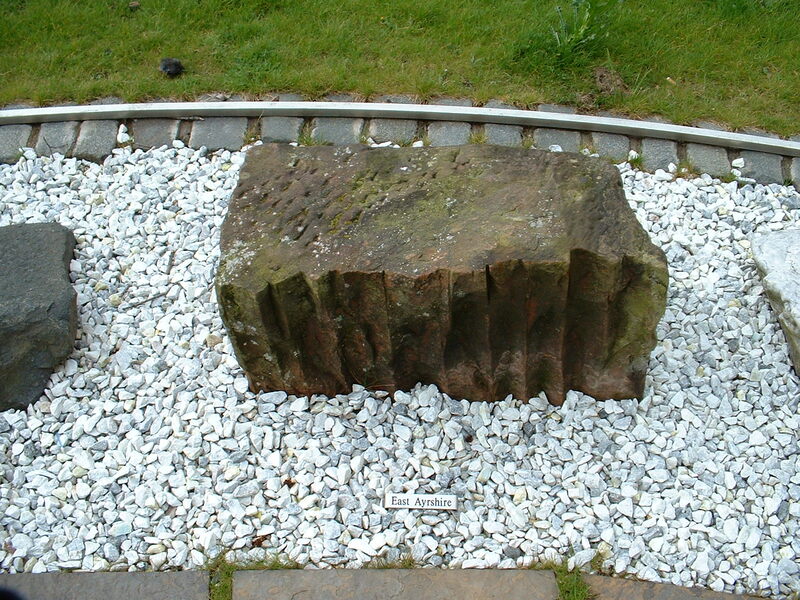 The rock has been prepared to create a rectangular plaque upon which is Head L. Rather it is more of a torso, which may also have decoration running from the neck across the chest. 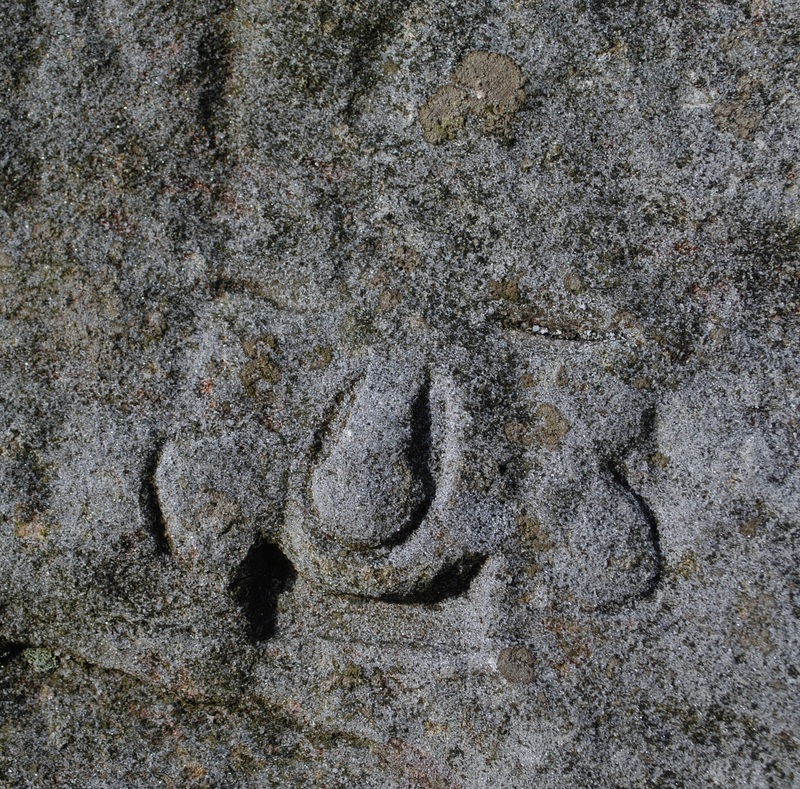 Similar in form to the figure on the top (Head I), side on with marked profile, and with a variety of symbols incised to its right. 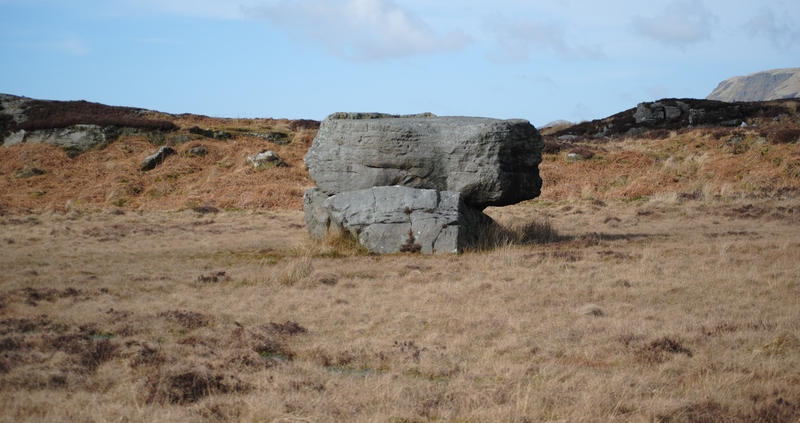 It like the figure on top (Head I) faces to the south west, perhaps evoking distant lands. Discovery of these three possible additional heads support the trend in overall distribution being focused at one end, and perhaps emphasises the potential significance which movement through the stones may have had. Travelling from the north-east (from a pantheon of deities) to the south-west could have been deeply symbolic and perhaps restricted to certain people or at certain times of the year. 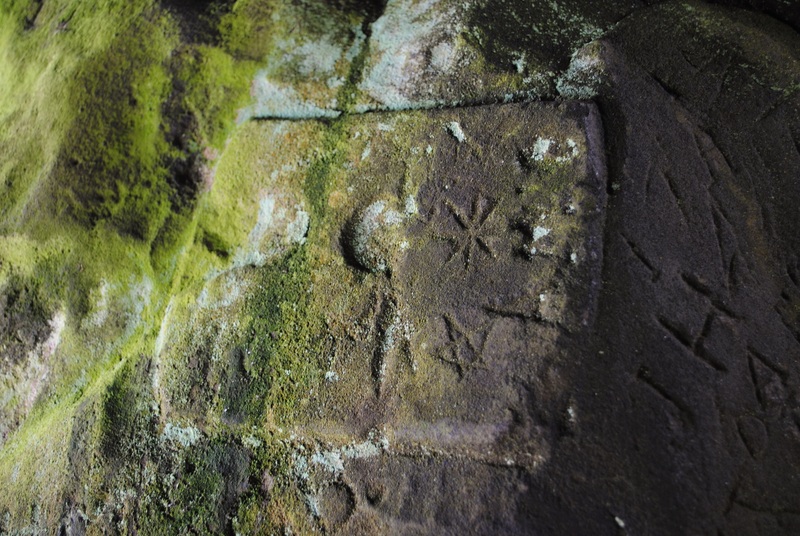 Who knew of this site two thousand years ago, who was allowed access to it, who was allowed to carve on it, who was allowed to pass through stone, or ascend to the sky? 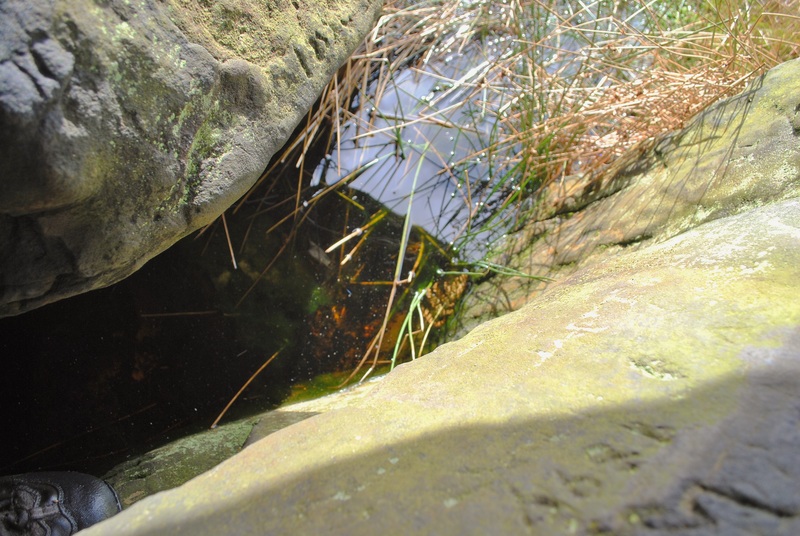 The passage is narrow and awkward, pitching the body at odd angles..
…I realised, as I splashed out into the sunlight, that below the rock passage was standing water. I had travelled through rock and over water. 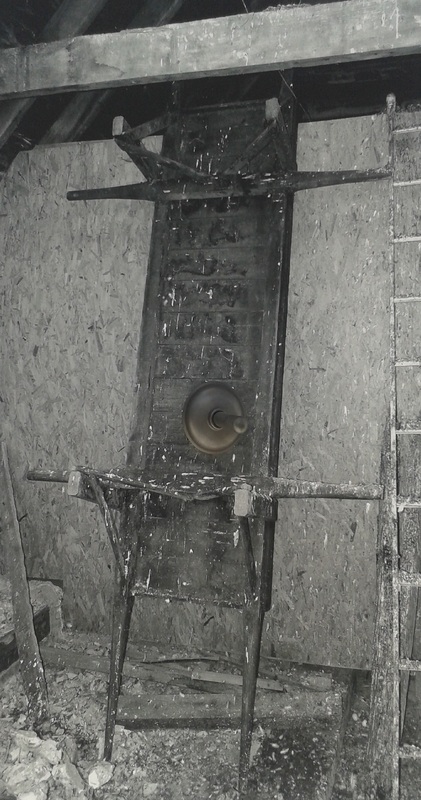 Leslie Alcock wrote about the site in 1977, traditionally called Auld Wives’ Lifts. There is no doubt, to my mind, that this site has had significance in the later prehistoric and / or early historic period, potentially a location of cult and ceremony. 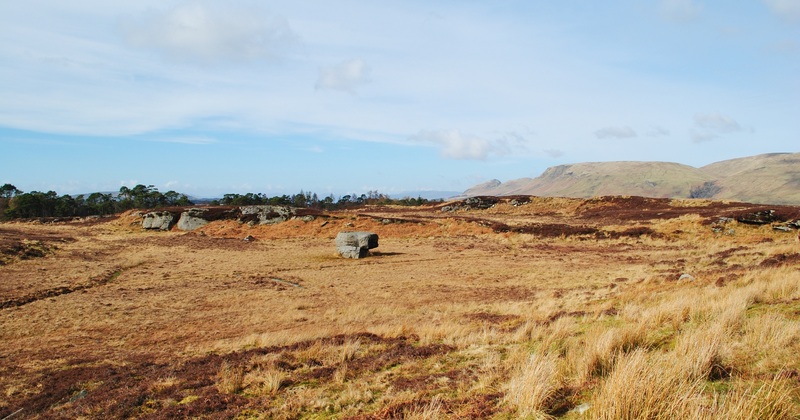 It certainly has some resonance with sites such as Dunadd where rituals of place and kingship may have been undertaken in the early historic period which incorporated other forms of carving. 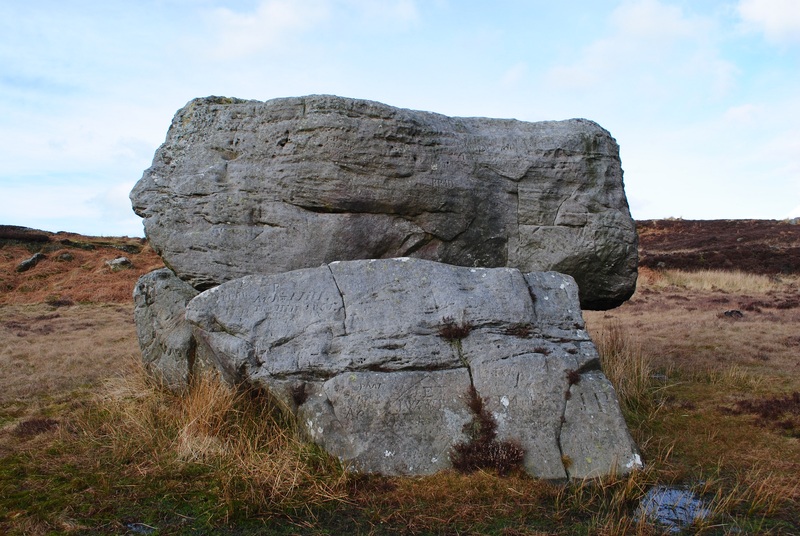 Indeed, the close proximity of Auld Wives Lifts to earlier ceremonial monuments has long been recognised, with a Neolithic chambered long cairn only 500 metres to the east. At that location, a similar inter-relationship with landscapes to the north and south is also experienced. 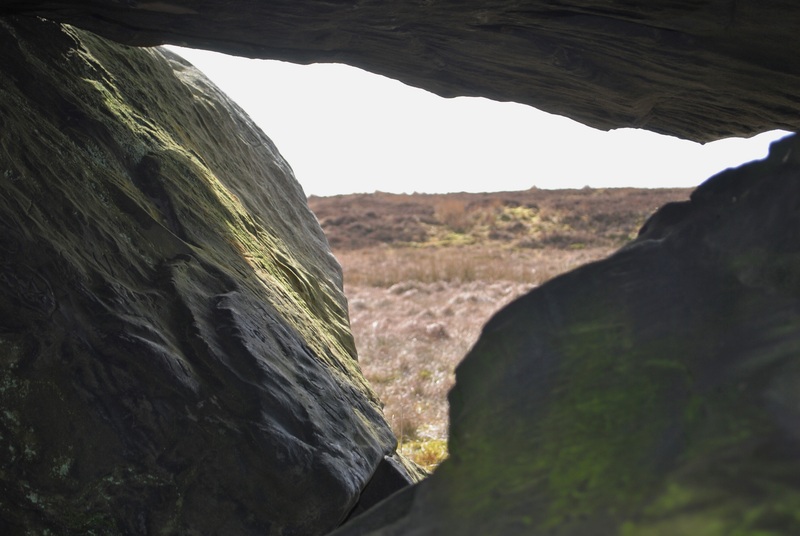 Also with the chambers in the cairn, people in the past would also have experienced travelling from light to dark and being returned to the light again. We know from sites elsewhere that people in the later prehistoric and early historic periods revisted and reused Neolithic and Bronze Age ceremonial sites. It is possible then that how Auld Wives Lifts was understood and was used two thousand years ago made reference to earlier sites and rites. Alcock, L 1977 ‘The Auld Wives’ Lifts’, Antiquity 51, 117-23. Ure, D 1783 The History of Rutherglen and East-Kilbride; Published With a View to Promote the Study of Antiquity and Natural History. 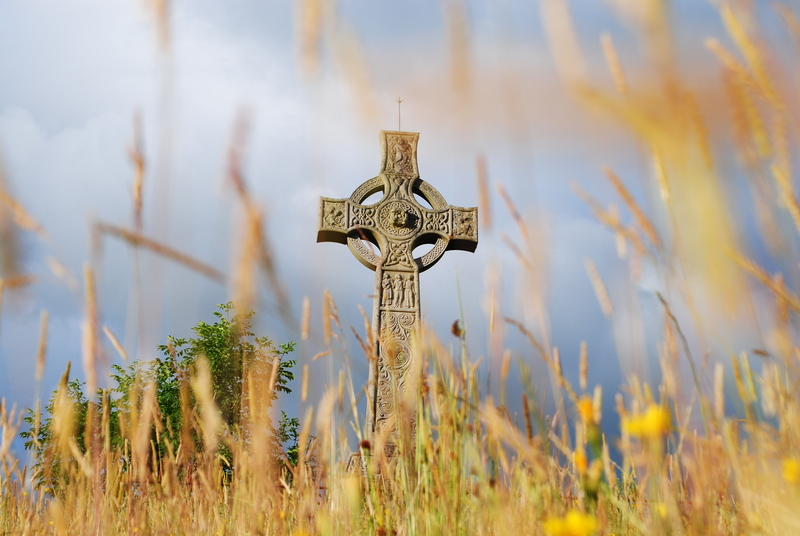 Further information can be found at RCAHMS Canmore. 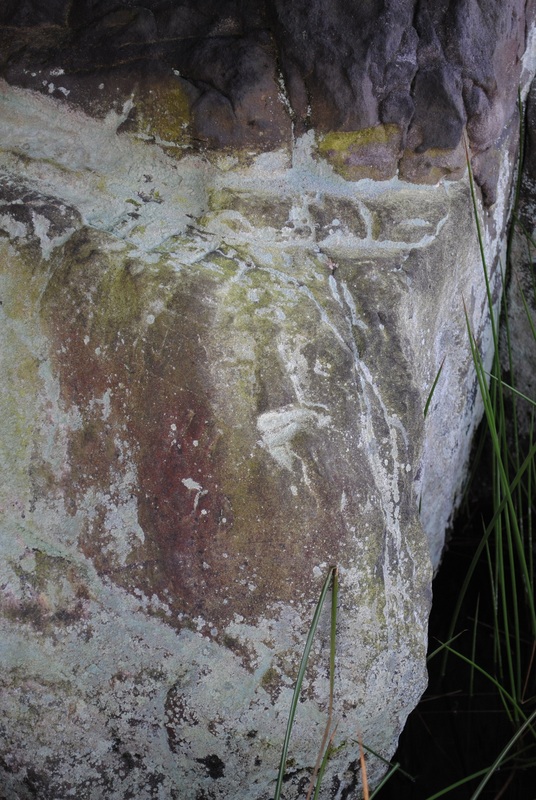 If you are going to visit the site, please do not touch or modify the carvings, they may have been there for 2000 years. 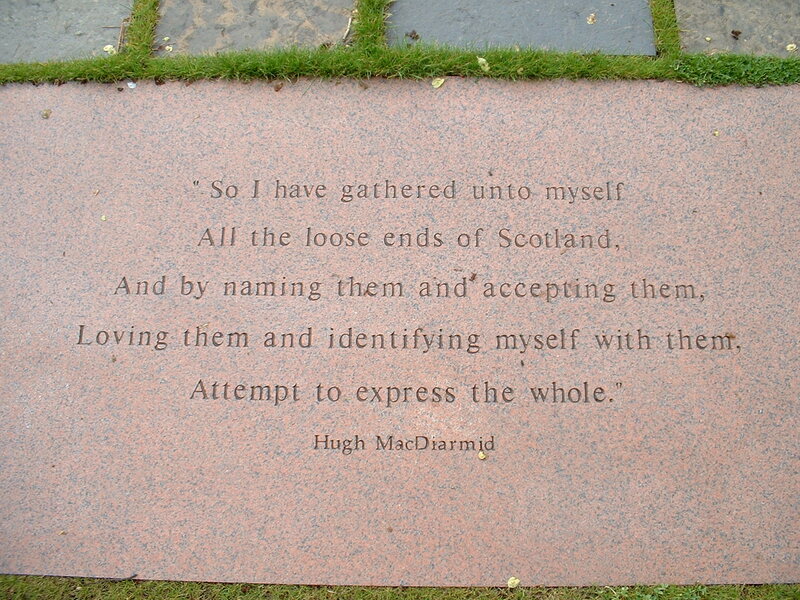 The text above is from Priscilla McLaren for her husband Duncan McLaren upon the memorial overlooking Loch Awe. 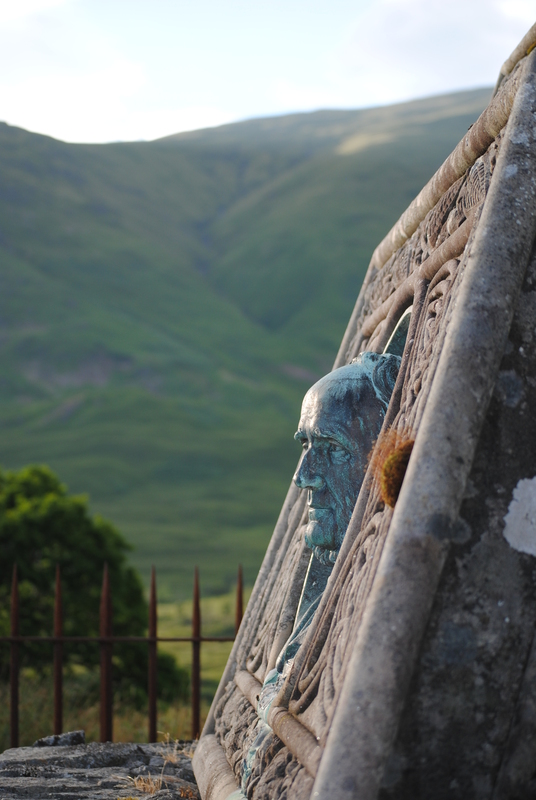 The memorial sits at the mouth of Inverstrae, upon the footings of a longhouse, where he stayed for two years when a boy: ‘He was born poor, and never forgot or strove to conceal the fact’ (Mackie 1888 v1, 8). Priscilla McLaren was founder of the Scottish division of the National Society for Women’s Suffrage. 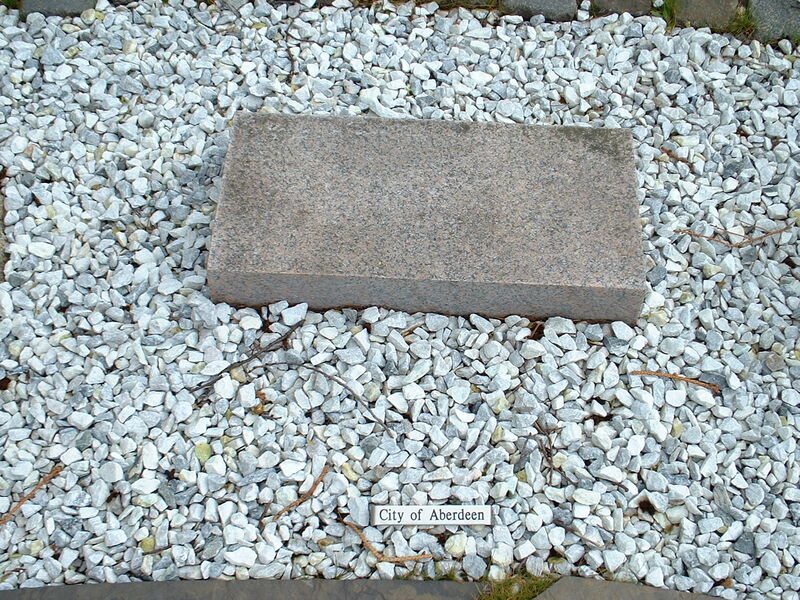 Duncan McLaren was a liberal reformer who was elected Lord Provost of Edinburgh and then served as MP for Edinburgh. 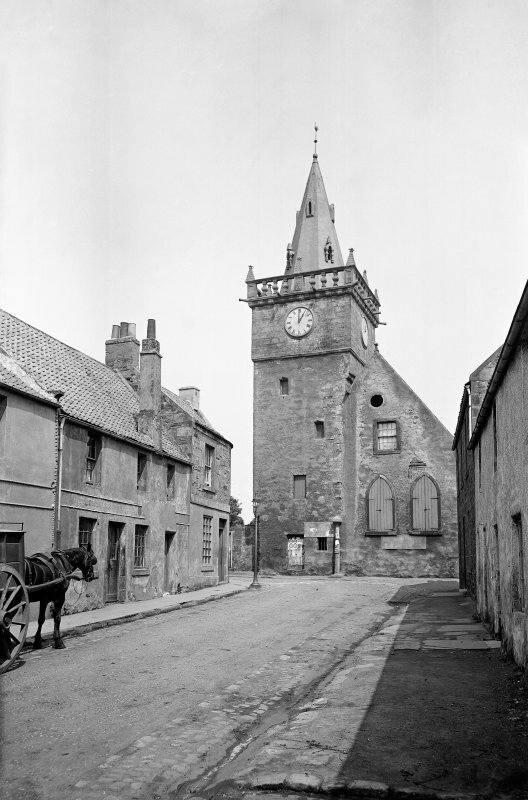 Further details of Priscilla McLaren (1815 – 1906) and Duncan McLaren (1800-1886) can be found via archives hub. 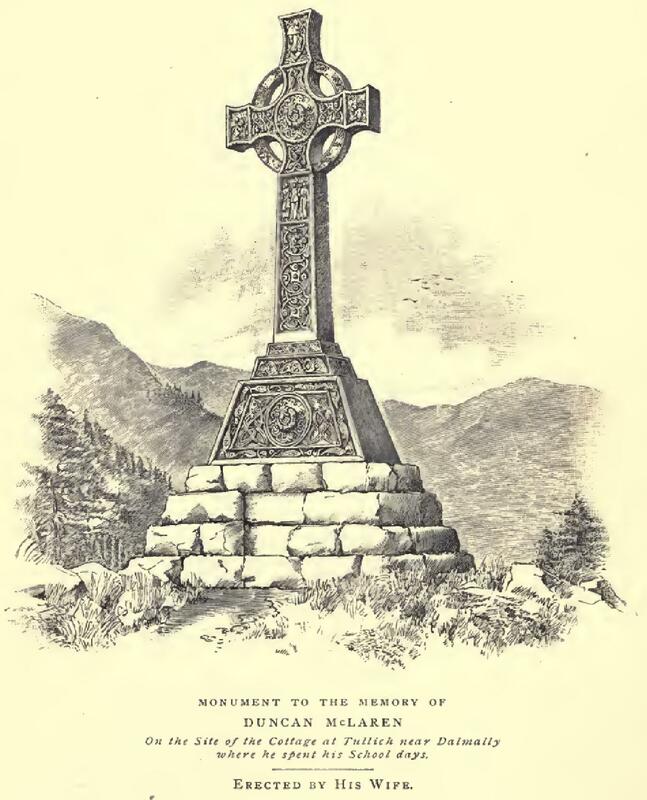 The engraving of the McLaren monument is from the 1888 ‘The Life and Work of Duncan McLaren’ by John Beveridge Mackie, which can be found at Archive Org. The McLaren monument is an exquisite piece of sculpture but is clearly deteriorating with conservation management issues. 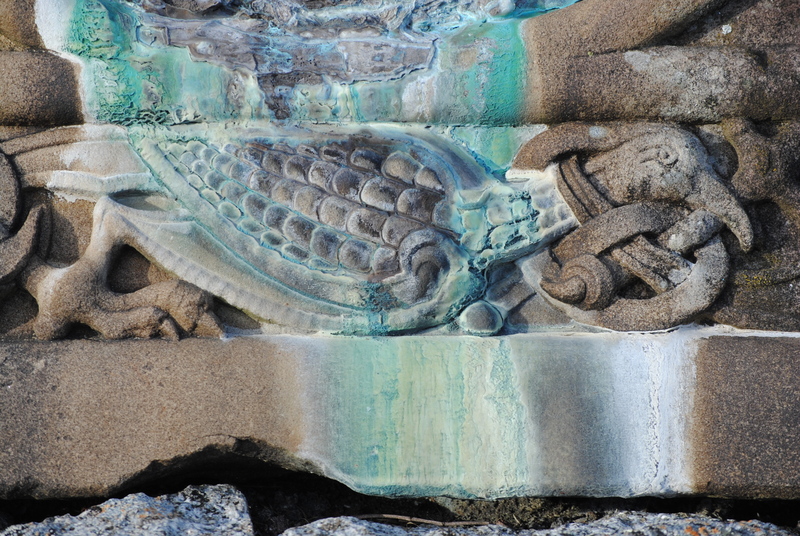 It was produced by Mitchell Wilson architects of Edinburgh and made by W Beveridge, Sculptor, Edinburgh, probably at a workshop on Dalry Road just before 1900. 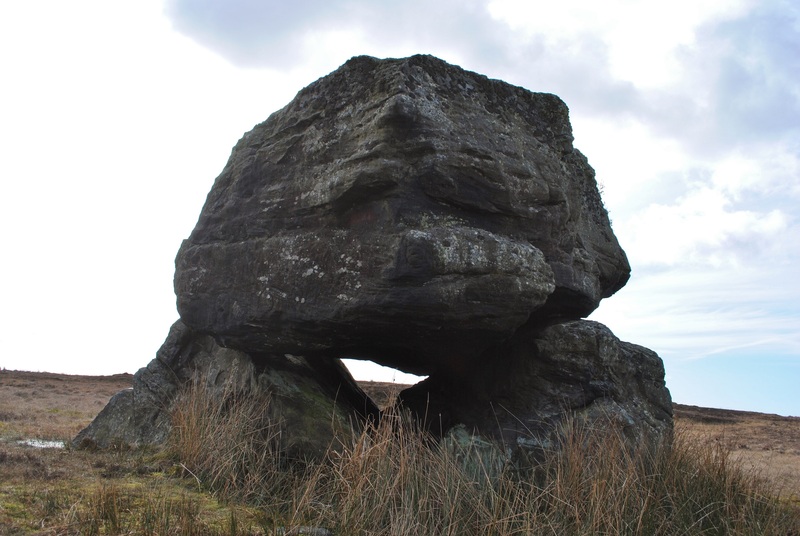 Sawney Bean, the legendary Scottish cannibal, who is said to have lived in a cave on the Ayrshire coast with his family in the late 15th century: preying on over 1000 passing travelers. Artist Adam McEwen’s ‘Sawney Bean’ exhibition at The Modern Institute playfully explores the mythology, materiality and geography of ‘Sawney Bean’ as mediated through personal biography. Most striking perhaps is the poignant representation in graphite of a wooden coffin carrier found in a family barn on the Ayrshire coast. 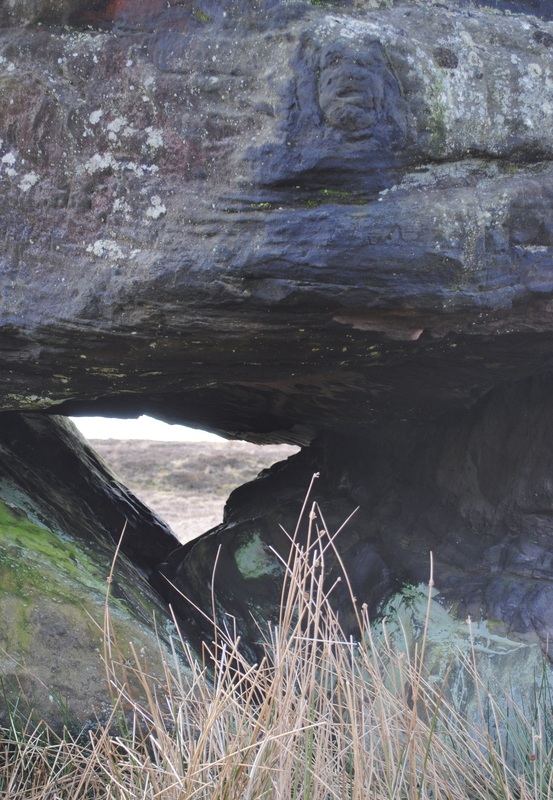 For centuries people have been coming to the cave, a place of contemplation and prayer on the Machars. 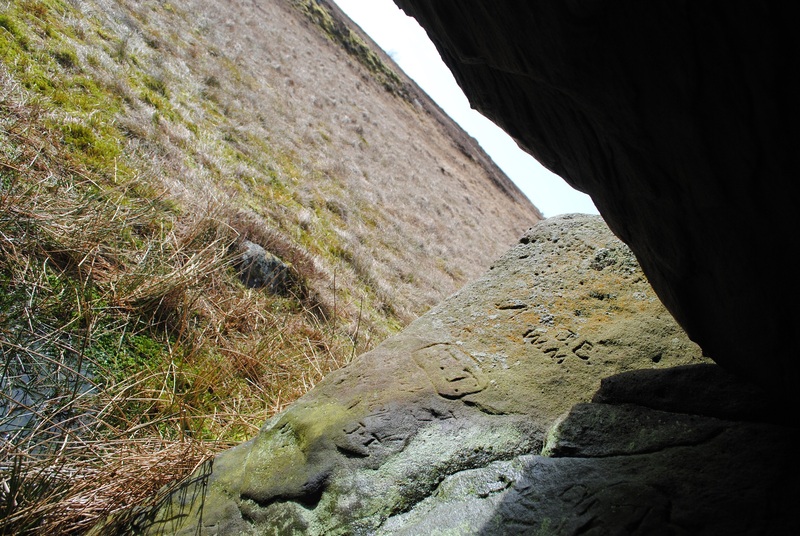 Many have inscribed crosses, names and initials on the walls of the cave. 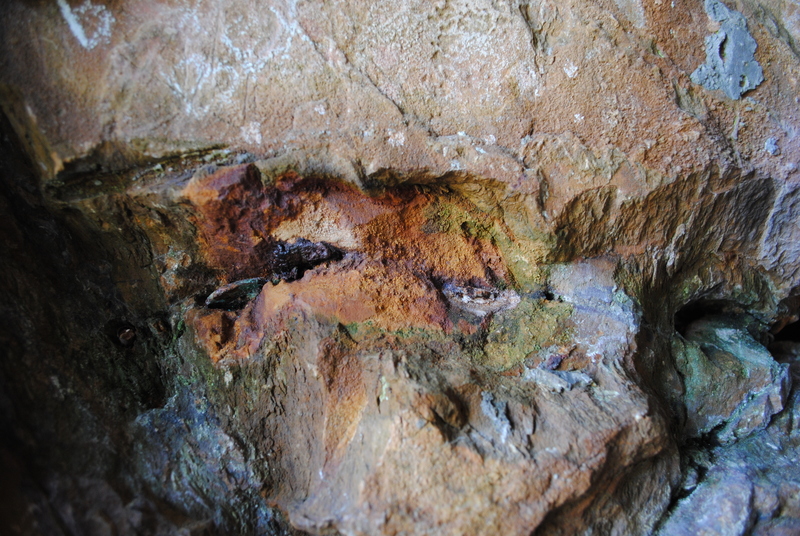 Some set coins in cracks in the rock which tarnish and slowly corrode. 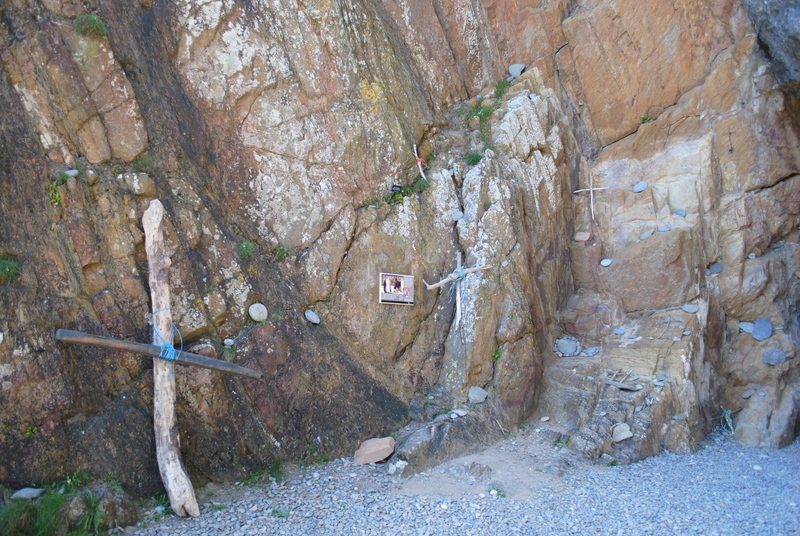 Others place stones with dedications on them, around the cave, and a few lean crosses against its walls. 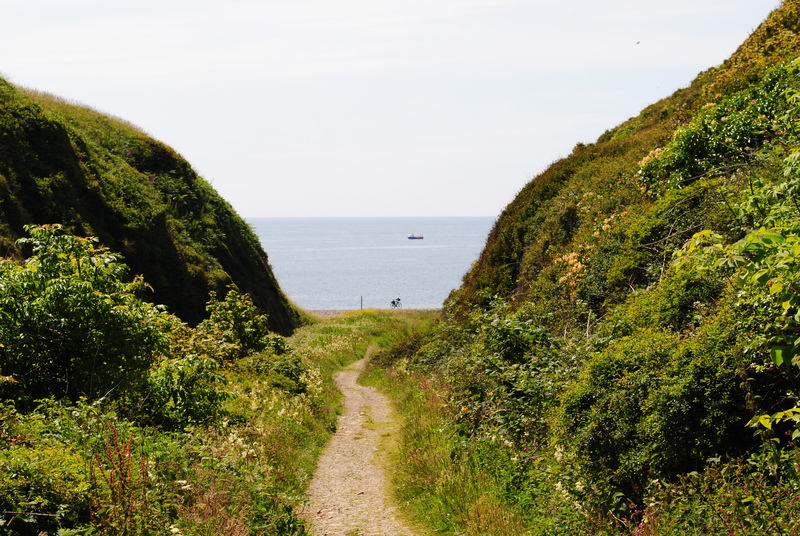 To reach this special place traditionally you would travel along the pilgrimage trail through the Machars via Whithorn. 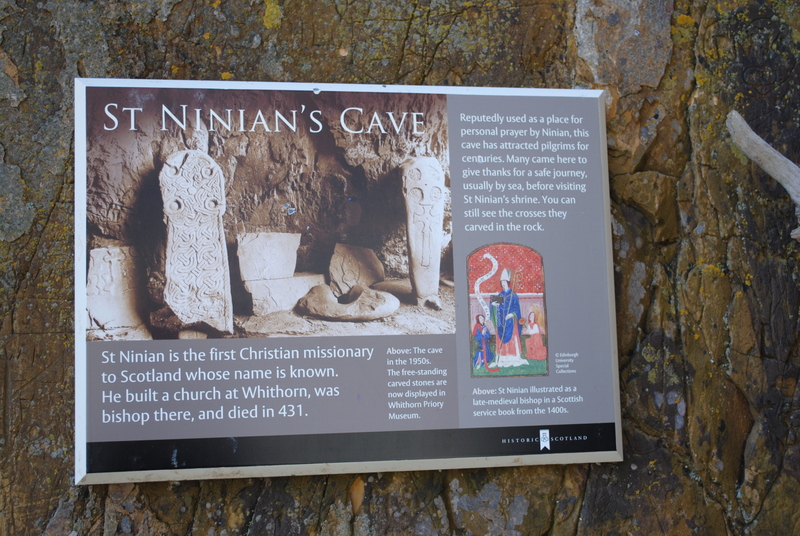 This long association started with St Ninian’s mission in AD 397, then resulting in pilgrimage to a shrine at Whithorn from the 7th century onwards. For there protection many of these important Medieval stones were gathered together at the museum in Whithorn. For over 30 years The Whithorn Trust have been researching the archaeology and heritage of the Machars and revealed some amazing things. 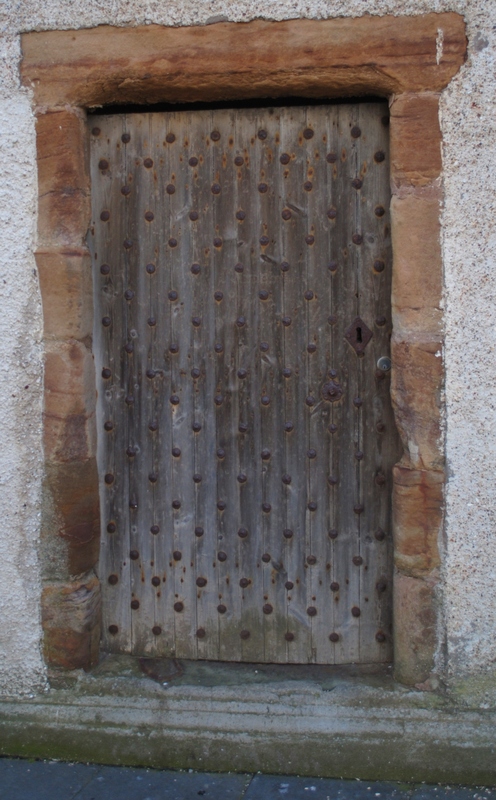 Most recently they have undertaken an exciting project investigating the archaeology of the Machars. 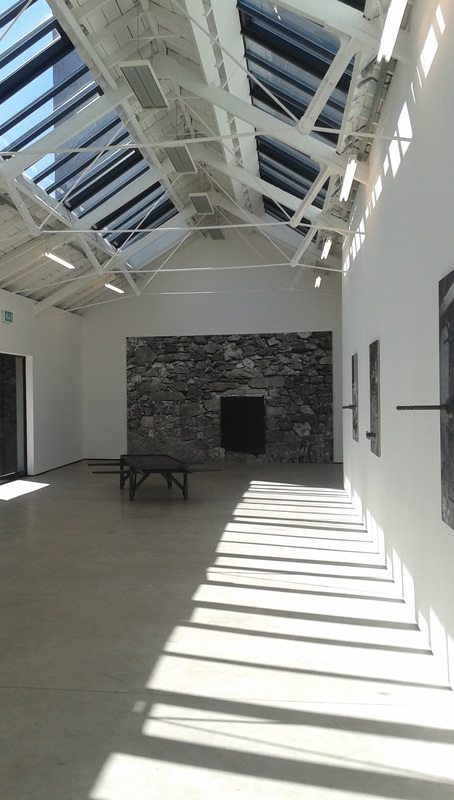 It was however announced earlier this year that The Whithorn Trust and Whithorn Story Visitor Centre may be closed due a lack of funding, a situation which leaves the future of this significant heritage centre and many important artefacts it curates uncertain. 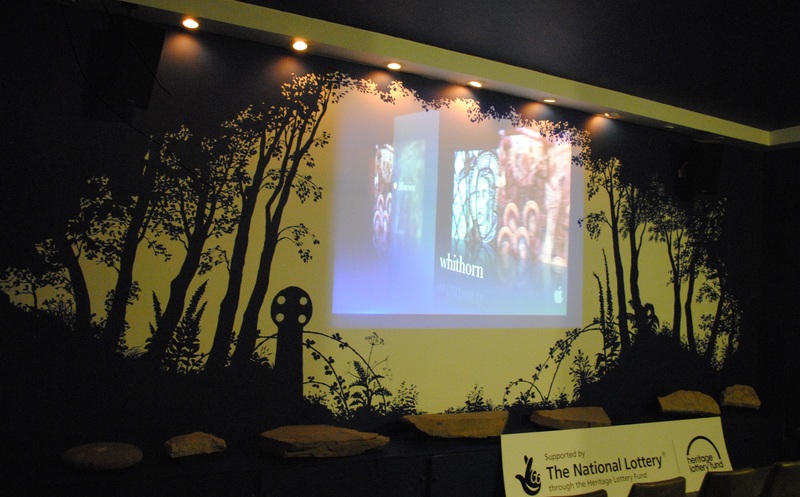 Importantly for the visitor experience The Whithorn Story Visitor Centre forms part of a hub with the Historic Scotland Whithorn Priory and Museum. 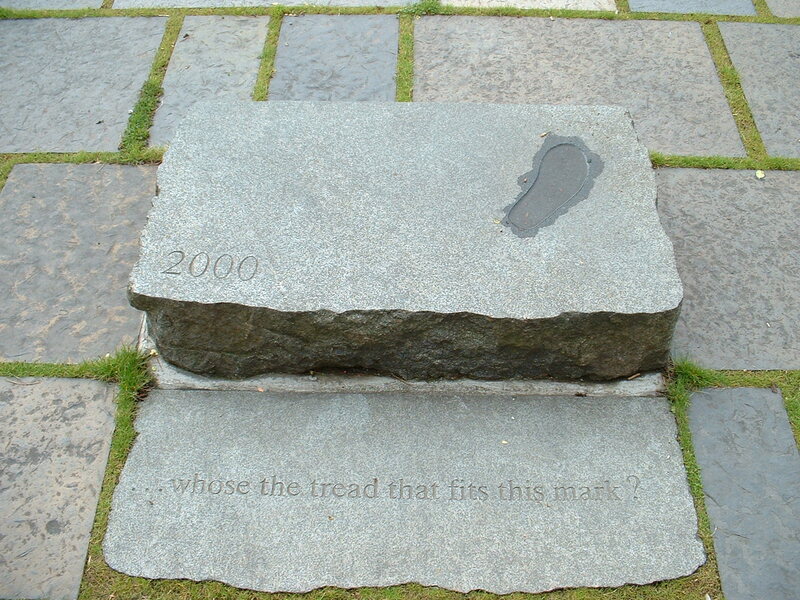 The stones in the museum were redisplayed in 2004 in partnership between Historic Scotland and the Whithorn Trust, with Heritage Lottery Funding. 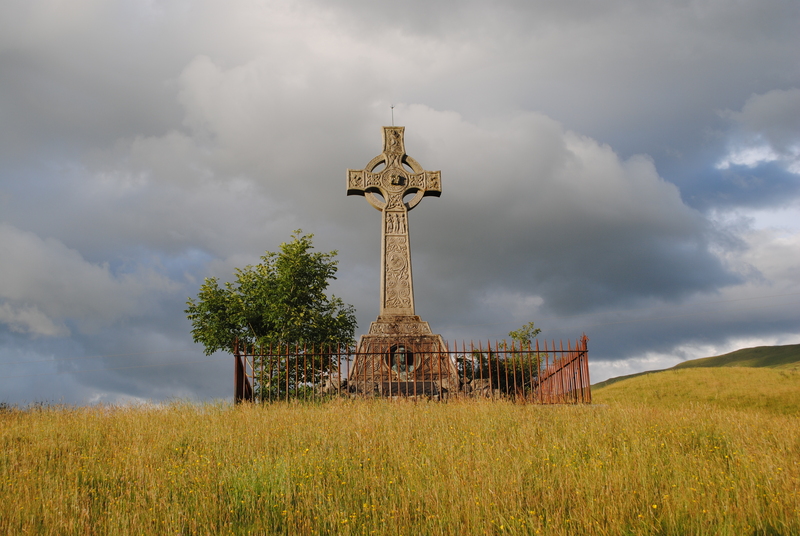 An important relationship between people and the heritage of the Machars is in danger of being severed. 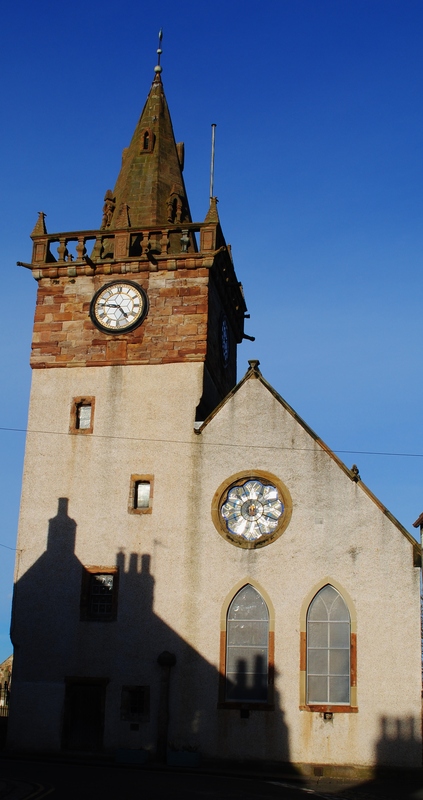 Please help by adding your support to the petition to save The Whithorn Trust. In the current economic and political climate, we need to value and support our museums and heritage centers. Like other forms of art and culture, which make our society far richer and more vibrant, they can be soft targets at such times. 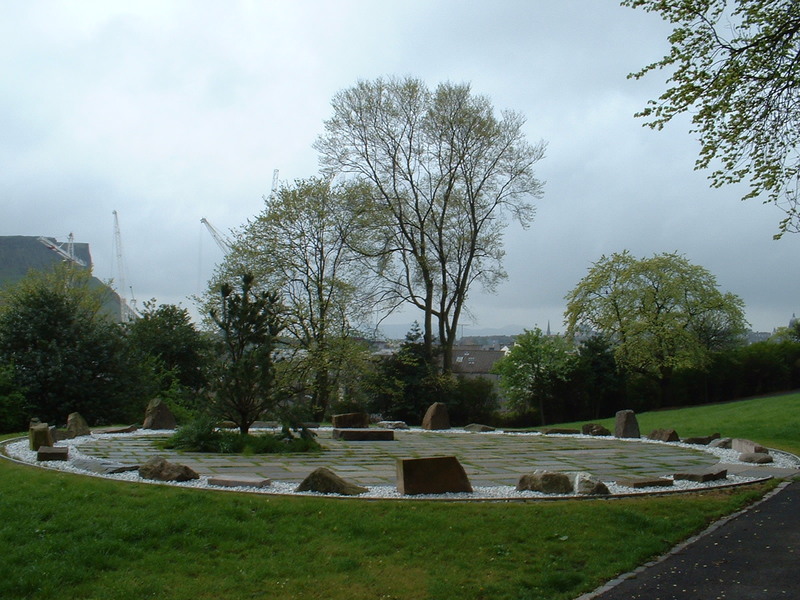 As places of communal memory, we are poorer without them and our relationships to the landscapes we inhabit will be even more difficult to maintain, grow and enhance. 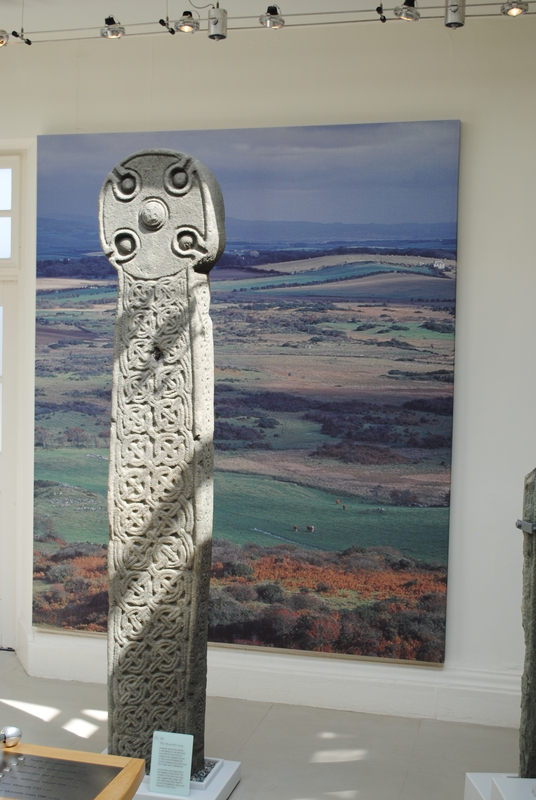 The Whithorn Priory and Museum micro site has further complementary information about Whithorn and the Machars.